that its steadfast commitment to Heading Home reaps real rewards for homeless families. In 2011, Heading Home helped more than 2,000 homeless people in Greater Boston by providing them a place to call home and opportunities for self-sufficiency. Two-hundred and fifty units of housing have been created since 2006, with 61 new units created in the past year alone. More than 400 volunteers annually commit their time and energy to Heading Home, and the commercial real estate community provides a large number of those volunteers. 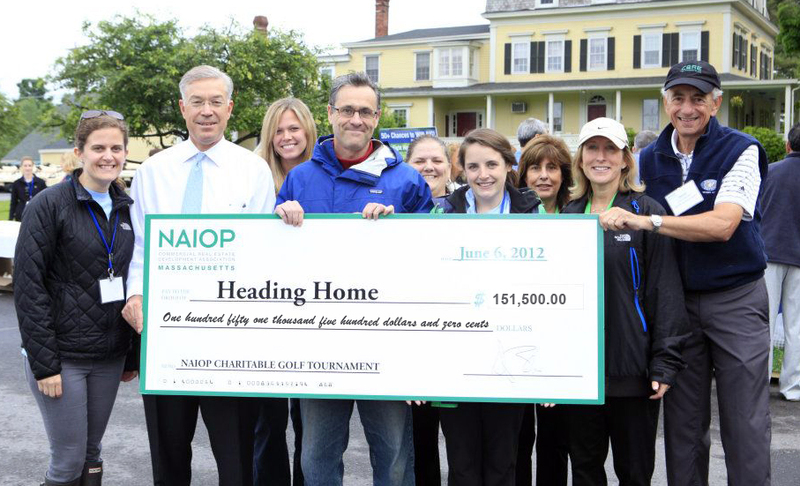 The monies raised by NAIOP will continue to support Heading Home’s programs to end homelessness locally. Andrew Hoar, president of CB Richard Ellis/New England and chair of the 2012 NAIOP Massachusetts Charitable Events Committee, led the effort to make this record-breaking donation possible. Andy has been on the Heading Home Board of Directors since 2007, and he, his wife, and his firm are longtime contributors to the organization. Andy’s efforts this year hit the fundraising goals out of the park! Another ardent Heading Home supporter who deserves special recognition is NAIOP Massachusetts CEO, David Begelfer. David has been actively involved in the struggle to end homelessness for more than 24 years, and started the annual NAIOP golf tournament to support Heading Home. In 2010, David received the Bob Ray Partnership Award from the Massachusetts Housing and Shelter Alliance for his commitment to ending homelessness. His support of Heading Home, including serving on the organization’s Advisory Council, has been unwavering through the years. Since the first NAIOP Golf Tournament that raised $5,000 for Heading Home, the commercial real estate industry has continued to come together to show support for homeless families and individuals. Thank you to NAIOP’s member volunteers, staff, and generous donors who helped to raise this record-breaking donation for Heading Home. It is only through their support that the tournament is able to raise funds needed to help Heading Home accomplish its goal of ending family homelessness. This entry was posted in Housing, Local News, NAIOP News and Events and tagged Golf, Greater Boston, Heading Home, Homelessness, Massachusetts, NAIOP Massachusetts, Real estate by Reesa Fischer. Bookmark the permalink.